Bad boys turned good, kisses in the rain, climbing through bedroom windows... It only happens in the movies. My new favourite book in the world ever. 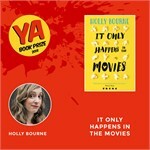 The author of the hilarious anti-romantic comedy novel It Only Happens in the Movies, Holly Bourne recommends her top reads of 2017.